DSB, an abbreviation of Danske Statsbaner (Danish State Railways), is the largest Danish train operating company and the largest in Scandinavia. Via it’s shipping division the company used to operate train and car ferries operating across the Danish strait of Great Belt. A train ferry link was established in 1883, whilst car ferry operations commenced operations in the 1930’s. In the 1990s, with the expected opening of the Great Belt fixed link, the Danish state interest in DSB’s ferry operations waned. In 1995 the shipping division of DSB was split off into a separate, state-owned operating company called DSB Rederi A/S, in 1995, being renamed Scandlines Danmark A/S in 1997. Ferry services ceased operating with the opening of the Great Belt Fixed Link, which occurred in 1997 for rail traffic and 1998 for car traffic. 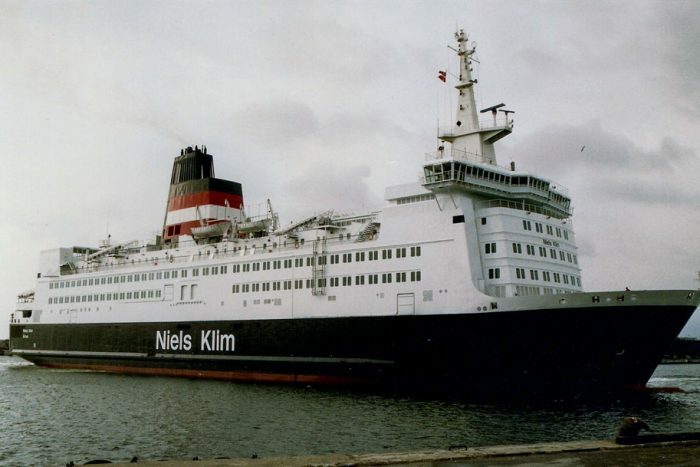 The last service was operated by the MV Arveprins Knud and departed Halsskov at 10 pm. on the 14th June 1998, the same moment that the Great Belt Fixed Link was opened for regular traffic. MV Stena Nautica, ex Lion King II, Lion King, Isle of Innisfree, Niels Klim – Steel motor vessel, built by Nakskov Skibsværft A/S, Denmark (233) for DSB (Danish State Railways) in 1986 (Yard No 234) as a passenger and roll-on roll-off car and commercial vehicle ferry.